During the 13th century a Romanesque basilica was built on a hill outside the village, but only the ruin of the bell tower covered in greenery and the remains of the surrounding boulder wall that was probably built already end of 13th – beginning of the 14th century are still preserved. On the southern side the ruins of a former bastion can still be identified. The rest of the church was demolished in 1805, the resulting material being used to erect a new building inside the village. The neoclassical hall church is covered with penetrated barrel vault and has a bell tower on the western side. The neoclassical altar was built in 1877 by Fritz Reuschel from Sebeş and the Rieger company built the organ in 1895. On a hill not far from the center of the village Petrești the ivy-overgrown ruins of a tower and an almost perfectly preserved curtain wall are to be found: these are the remains of a former fortified church. 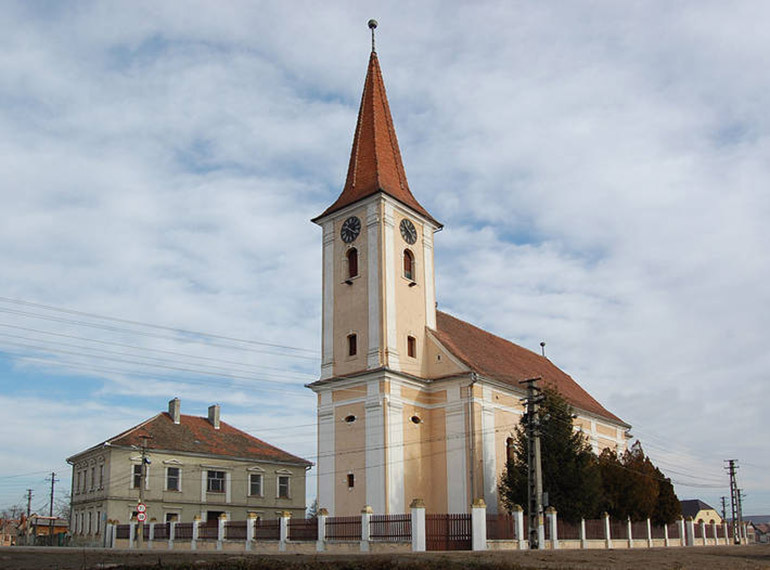 Today the Divine Service for the largest rural Saxon community in Transylvania is being held in the church built beginning of the 19th Century. However the Evangelic cemetery it is still located under the curtain wall. In the time when the old church was still in use many legends were born. Thus, it is said that a peasant was returning late from the mill, when a huge white dog cut his way growling. The man was astounded to discover that the animal’s aspect resembled his neighbor. He immediately thought that he was dealing with a werewolf, a spellbound man who transformed into a dog at night. Thus the white dog became famous, being seen as the leader of the dog pack of the village. And indeed, when the man’s neighbor died, the dogs started to howl awfully, coming one by one to do the deathwatch and staying around the coffin.